The truck was transporting two skips. Safety standards by drivers operating large vehicles in Malta often leave much to be desired but this truck driver is clearly pushing the limits. This picture shot on Saturday morning shows a truck transporting two skips packed to the brim with garden rubble driven through the area known as T'Alla w'Ommu, off Naxxar. One of the skips appears to be tilting dangerously towards one side, posing a potential hazard to other drivers. 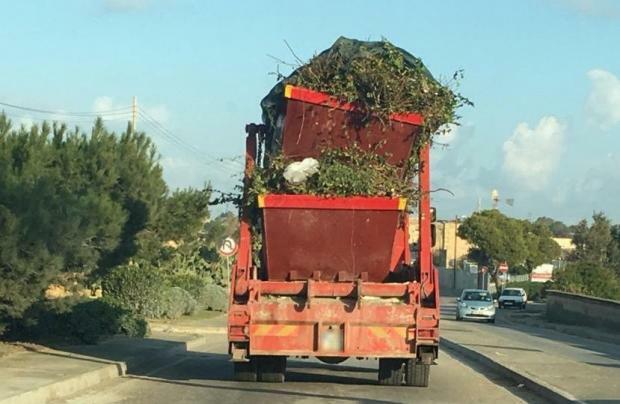 "Apart from safety aspects, why is this waste going to Magħtab not to the domestic stream being turned to energy and compost," asked the Times of Malta reader who sent in the picture.